-JdK- Richard in the UK looking for a W7 exhaust camshaft for his 1929 Model 18 Norton as it has broken in two. Please let us know if you have one you can spare. 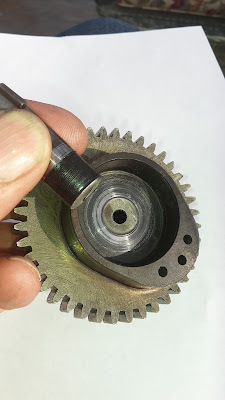 Richard: "I have probably ridden about 500 miles on it since I finished the restoration last year (it was a compete basket case) so I was surprised that the camshaft broke now. I attach a couple of pics of the bike. 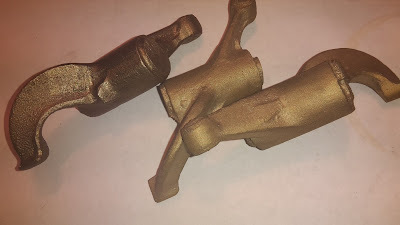 On an unrelated topic, as part of the restoration I was missing one inlet rocker and so I used the rocker from my 1928 Model 18 as a pattern to make AB2 (Ni-Al bronze) castings. I had four made (pic above). I machined one and it's running on the bike but I have three remaining unmachined castings. If anyone wants one I will post at £60 a piece + postage. That is what they cost me. They will need to do their own machining. Also above a pic of the 1928 Model 18 from which I borrowed the inlet rocker). I acquired this from a Bonhams Banbury auction a few years ago as boxes of bits. I have used it for two Banbury runs and it goes to the Manx GP every year - goes like stink!" Please contact us for Richard's contact details if you have a spare camshaft or need a rocker.